Last year designer Raf Simons premiered a line of Joy Division and New Order inspired rain gear at his runway show in Manhattan. Simons has now introduced additional items which blend "nostalgic inspirations and futuristic outlook" and feature Peter Saville's iconic artwork. The items include a Joy Division Unknown Pleasures convertible 2-piece hoodie, see-through New Order Substance shirt, and Joy Division + New Order baseball caps. 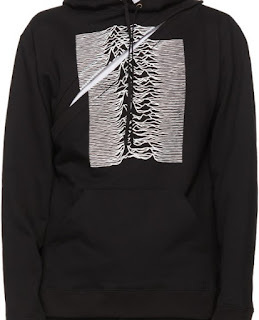 But OH the price of fashion: The New Order shirt pictured above retails for $940 and the Joy Division hoodie pictured at the top of this post is $1060. 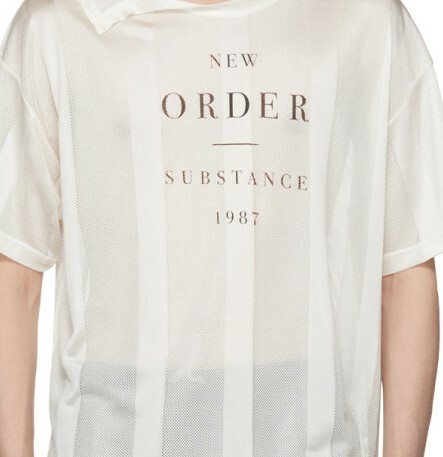 Seriously hope Peter Saville and Joy Division/New Order get a major cut of the action. Check out and/or purchase the designs here via Hypebeast.